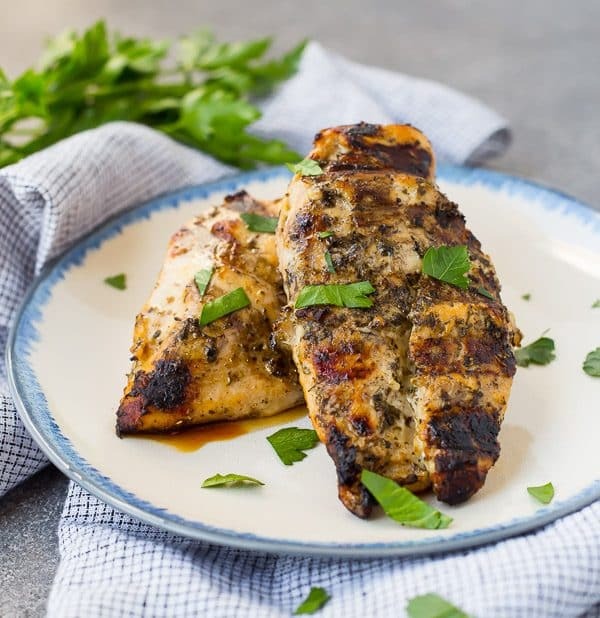 This balsamic chicken marinade is made using all ingredients you probably have on hand. It will become a favorite for both grilling and cooking in the oven! I know the interwebs are full of pumpkin spice everything at this point, but we’re still keeping the grill going strong. If you’re not, make sure to bookmark this one for next grilling season, OR try it in your oven or a nice hot skillet on the stove. I made this on Labor day for a small family barbeque and I contemplated waiting until next year to share it with you but that’s lame. I don’t like keeping things from you guys. 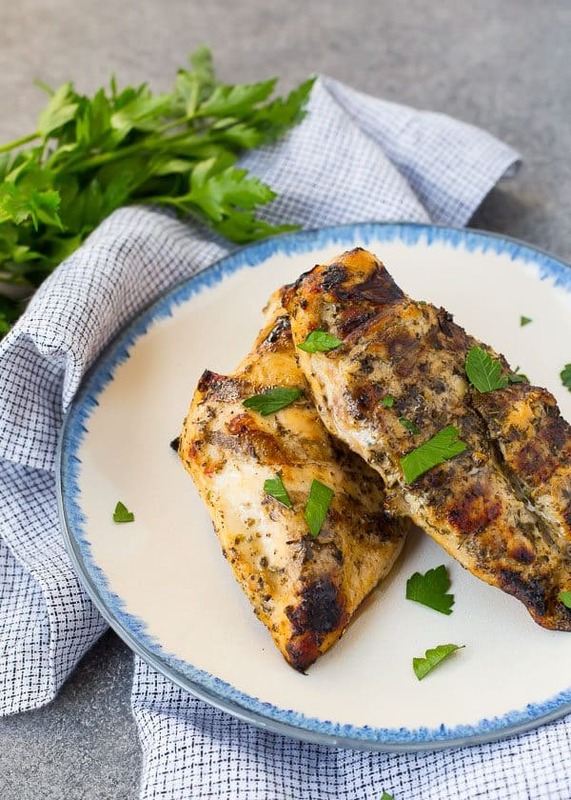 One of the reasons I chose to make this marinade and not one of my usual ones (like this greek marinade or my personal favorite shish tawook marinade), is because I was embarking on Whole 30. I must be out of my mind, right? NO POPCORN FOR 30 DAYS. Guys, I can do this. Right? And I get it. Beans are a friend of mine. Whole grains, too. And I don’t think dairy is the devil, obviously (I actually think it’s pretty great) — you’ll see a wealth of cheese, milk and butter here on Rachel Cooks. I don’t think there is anything wrong with eating these foods. My diet isn’t overly sugary to begin with and I really only drink alcohol if we go out for dinner on the weekends or have guests over. So that part of it will be easy. One of the main reasons I want to do Whole 30 is to retrain my brain in terms of food. So often if we’ve had a stressful bedtime with the kids, I come downstairs and I tell myself that I “need” a bowl of popcorn. No, I do not! I’m not hungry, I’m just stress eating. Or eating it because I like to unwind and watch TV with a bowl of butter-laden popcorn. So, my mom is going to babysit my air popper (she threatened to sell it — what a meanie!) and I’m going to stay away from purchasing a new air popper on Amazon Prime. I also want to see how I feel with the absence of these foods in my life. I’m pretty stubborn and strong-willed so it’s more a test of me than anything else. I want to put myself to the test and see how I fare with this exercise of willpower and discipline. Anyone done it? I know you’re out there! I’d love to hear your tips — could you leave them and any favorite Whole 30 recipes in the comment section? Anyways, verrrrry long story short, I was hoping there would be some of this chicken leftover for me to eat once I started Whole 30, so I didn’t want to use yogurt in the marinade like I normally do. But there wasn’t any left. That’s a good sign that it was a success and I’ll definitely be making this balsamic chicken marinade time and time again. PS: This site is not turning into all Whole 30 recipes for the next 30 days, or ever. I have lots of great content to share with you while I’m enjoying all my meat and vegetables. Don’t you worry! If you don’t want to grill this, it would be great broiled, baked, or cooked in a grill pan too. It would be absolutely fantastic on top of a salad or pasta. The balsamic chicken marinade is very simple — without salt and pepper, it’s only 4 ingredients. You whisk together olive oil (I know you have some of that! ), balsamic vinegar, Italian seasoning, and garlic powder. Add some salt and pepper and it’s chicken marinade perfection. Tip: If you prefer, you can use a couple of cloves of minced garlic. I have family members who are sensitive to garlic so I often opt for garlic powder. Both will work great in this recipe! I’d recommend marinating this chicken for at least 2 hours, but you can leave it in the marinade (in the fridge, of course!) for up to 24 hours. A marinade made with all ingredients you probably have on hand, it's going to become a favorite for both grilling and cooking in the oven! In a small bowl or measuring cup, whisk together olive oil, balsamic vinegar, garlic powder, Italian seasoning, salt, and pepper. 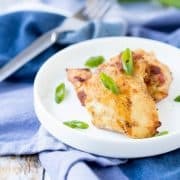 Place chicken in a bowl or a zip-top bag and pour marinade over chicken. Move chicken around to make sure it's all coated with marinade. Place in fridge and let marinate for at least 2 hours up to 24 hours before grilling. Cook until internal temperature reads 165 degrees Fahrenheit on an instant read thermometer. I like to use white balsamic vinegar so I don’t discolor the chicken, but traditional balsamic vinegar will work too. Note: This is my favorite thermometer! Nutritional information is a very rough estimate, given that much of the marinade is thrown out. 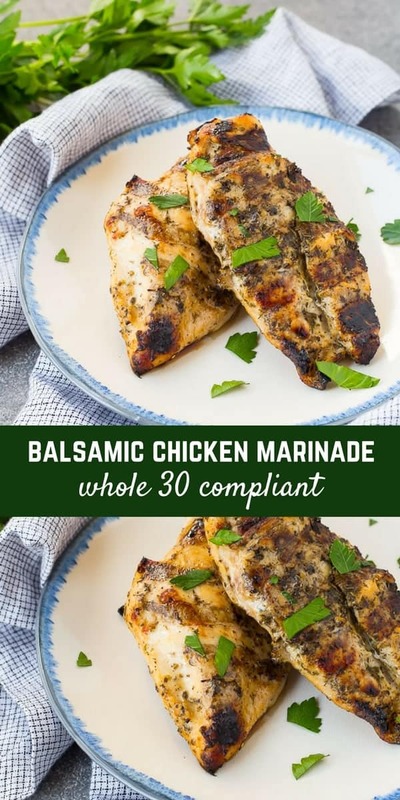 Verdict: I’m going to be using this balsamic chicken marinade recipe weekly during Whole 30. And maybe even afterwards. Husband’s take: He loved this! The whole family loved it. We’ve made this several times. I throw the chicken in the marinade on the day I do my shopping and we’ve grilled it anywhere from 24 to 72 hours later with great results. Thanks so much! I’m so happy to hear that you like this recipe! Thank you for taking the time to come back and leave a comment! I made this chicken recipe with dark meat on the barbecue and it was incredible. We were 11 people and everyone from my 9 month old daughter to her grandparents were licking their fingers. So happy to hear that! Thanks Julie! I appreciate you taking the time to come back and leave a comment! Tried this with a side of caramelized carrots, yellow onion, and cherry tomatoes. It was perfect! Thanks for the recipe. Sounds like the perfect meal! Thanks for taking the time to come back and leave a comment! Super easy, super delicious! 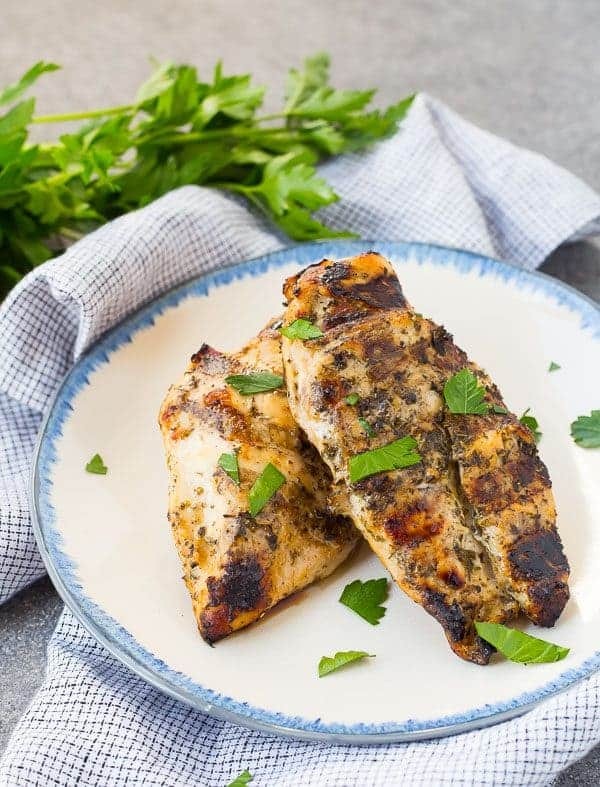 Even though I tend to overcook chicken, this marinade keeps it tender.So glad you shared this recipe, Rachel. Now I have something to fix for “my” night to cook dinner on our extended family vacation this summer! So glad to hear that! Thanks for taking the time to come back and leave a comment! I’m so happy to hear that! Thanks Renee! I’m trying this recipe tomorrow night. I’ve made another version of a balsamic marinade that had soy sauce, as most do. 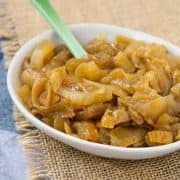 I wanted to cut down on soy & sodium, so was thrilled to find this recipe. I plan to add some white wine. I cooked this two ways! First meal it was grilled on my George Foreman, which was delicious, but letting it marinate for 24 hours and then cooking it on the stove to throw into pasta was the best!! Just finished prepping a second batch of chicken with the marinade! I’m so happy to hear that! Thanks for taking the time to come back and leave a comment! This was delicious! I cooked it on the stove, and it came out juicy and sweet. I guess the balsamic vinegar made it taste a bit sweet. I caramelized so well. Cut the chicken up and had it over salad. YUMMERS!!! 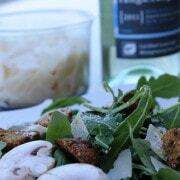 Hy Mylene, I’m so glad to hear you liked this marinade! Thanks for taking the time to come back and leave a comment, it means so much to me! This looks absolutely delicious! Also really easy to follow with the recipe! I will have to go with your suggestion and try it over pasta! 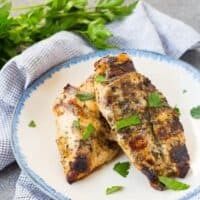 Can this marinade be used with fish, specifically tilapia? I’m wondering (three months later!) how your 30 days went. It went really well! I’m actually starting my second one on Monday! So simple, but it looks so tasty! Good luck on your Whole 30! Popcorn is hard to resist!